Adventure maps - is a map type where you have to complete certain tasks or quests. 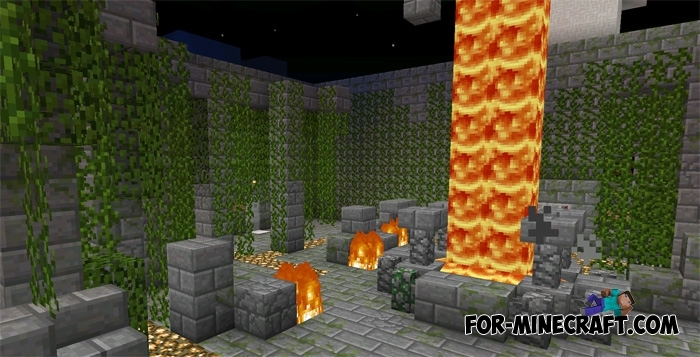 Most of these maps can be divided into the following categories: Adventure, Puzzle, and Parkour. In this article, we will show best maps for Minecraft PE in our opinion, which is fun to play, and the gameplay will enjoy the most demanding players. Tomb Crafter 5: Sphinx - is a the fifth map of Tomb Crafter series. At this time you went to Egypt to explore the ancient pyramids. Your task is to find three golden artifact. Also do not forget about the twelve emeralds, which will present an opportunity to open a secret room. The main quest is to find three ancient artifacts that are hidden inside the pyramid. - Set the maximum complexity. - Do not destroy the blocks. This map has been released by Mojang, to show all the new Redstone features (comparators, repeaters, droppers and hoppers), which became available in new versions of Minecraft Pocket Edition! - Complete the four levels of puzzles. - Help them to get to Cake Village. Another village was burned. Why did this happen? Perhaps a portal to hell is to blame? All villagers have gone missing. It's strange ... I hope that they are safe. I have to find them. - Do not destroy / put blocks. - Set the peaceful complexity. - Complete the four puzzles to get to the Cake Village. You are Redstone master? This map will check your capabilities with tasks and parkour. Have not completed mechanisms will be located in each level, to which you want to place the logic elements: red dust, redstone torches, repeaters, and other. If done correctly, the door will open and you will be taken to the next level. - Yellow clay = Red Dust. - Brown clay = Red torch or wooden button. - Orange clay = Red Torch. - Red clay = Stone or hopper. - Lilac clay = Comparator. - Lime clay = Red repeater. Peirasmos Realm - is an adventure map, the creation of which took more than 10 months. The result is amazing: ten levels with riddles, parkour, mazes and puzzles. You have been chosen and then sent to a place for an important test. Can you take the Peirasmos Realm throne? The only way to check this is to complete all the tests. - Do not destroy the blocks, if it is not required. - Play in survival mode. 2. Open it using any file editor. 3. Copy the folder with a map in: "games / com.mojang / minecraftWorlds". 4. Go to the game and select the desired map.